GLENMOOR — Residents are accustomed to seeing the Glenmoor Volunteer Fire Department’s unusual bright green fire trucks responding to emergencies around the township, but next week, they might be surprised to see a much different color at the station on Annesley Road. 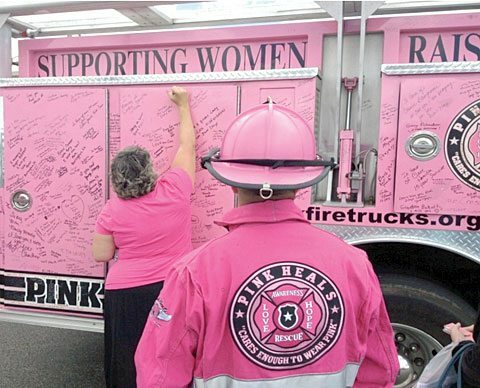 At noon Tuesday, the Pink Heals Tour will be stopping at the station with its pink emergency vehicles, bringing awareness and hope to those struggling with not just cancer but any illness or issue. Founded in 2007 by retired firefighter Dave Graybill, the national tour travels around the country, partnering with public safety organizations to inspire citizens, businesses and community leaders to “start putting people first” with home visits and local fund raising, according to its promoters. Men and women involved with the program commit up to 21 days to drive the bubble gum pink vehicles around the country for the program. Glenmoor firefighter Tonya Wilson heard about the initiative and sent a message, asking how a visit could be arranged; the next thing she knew, she was being called with the date and time. Wilson and Deputy Chief Bill Bennett encourage the community to come to the fire station Tuesday to meet those involved with the program, sign the pink vehicles and possibly purchase some of the special merchandise that helps fund the effort, which is operated totally through donations. Bennett said home visits by the tour can also be arranged that day which promoters said provide moral support, hope, love and validation to individuals and their families.